For some Canadians, a holiday in February means another long weekend to hang around the house and avoid the cold — that is, if you're one of the six provinces lucky enough to have it. But for others, Family Day marks the only statutory holiday until April when families can squeeze in a three-day getaway. This year, Family Day will take place on Feb. 18, 2013 in Ontario, Alberta, and Saskatchewan. British Columbia will also be joining in on the festivities this year with their first Family Day slated for Feb. 11. With a couple of weeks to go, Canadian families have plenty of time to plan a memorable vacation — one that'll have your kids still talking about it when they go back to school the next day. And if recent studies mean anything, it's that Canadians like travelling with their families. In fact, Manitoba and Saskatchewan lead the way with 84 per cent of Manitobans and 82 per cent of Saskatchewanians saying it's likely that they'll take a family vacation in 2013, according to a Harris-Decima survey of over 1000 Canadians. While not everyone has Family Day off, those who do can stick to the usual excursions to large malls and museums that will be open for business. However, if you're looking for a true vacation and not just an outing, check out some long-weekend getaways idea HuffPost Canada Travel put together. Family Day Getaway Ideas. Slideshow text follows for mobile readers. If you want to ski, there's no shortage of resorts running promotions for Family Day. In British Columbia, Whistler is offering residents up to 50 per off on lift tickets. Families in Ontario can trek up to Mont Tremblant in Quebec, though Mount St. Louis Moonstone and Blue Mountain are also popular destinations with locals. In Alberta, Lake Louise also offers a "First Tracks" program to those who've never skied or snowboarded before. Some families aren't fans of winter and that's completely understandable — the combination of snow, cold and ice isn't everyone's cup of tea. So if you're looking to make a long weekend getaway that's somewhat closer to a beach, there are a few indoor water parks dotted cross Canada. 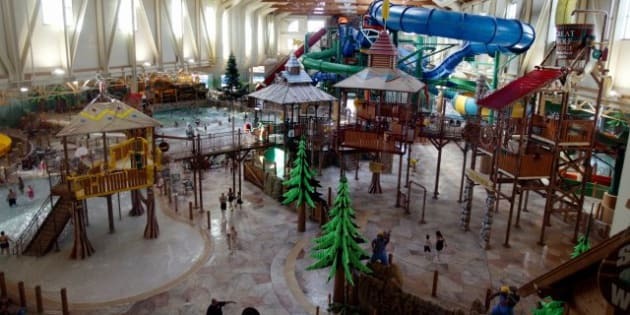 Great Wolf Lodge is a popular attraction for families and offers overnight accommodation for those who want to spend more than a day in the Niagara area. The West Edmonton Mall also holds the largest indoor water park in all of North America. To those who thought fishing was just a summer activity, think again. There's plenty of ice fishing holes across Canada, with notable ice holes in Cold Lake that are perfect for those in Saskatchewan and Alberta. According to WeatherSportsman, Cold Lake features fish that weigh 12 to 15 pounds on average. Last year in Ontario, visitors could ice fish without a license (usually $12.95) , with events being held in Atikokan, Ont., Manitouwadge, Ont. and Ontario. For families who'd rather ski cross country than downhill, Canada's national parks offer plenty of fresh powder this time of the year. When it comes to getting kids connected with nature; heck, when it comes to get kids to stop staring at a screen, it's hard to argue with the fresh, cold air and snow-covered wilderness found at National Parks of Canada. Families who aren't fans of cross-country skiing can opt for hikes or snow shoe their way across. Those who want to extend their excursion can do so by renting a cabin or lodge at some national parks. This may sound like a strange suggestion, but hear us out. February marks the time when high school students will have finished their exams and are starting to get anxious to see where they'll be going to school in September. It's not a bad idea to use the three-day weekend to visit a campus if your teen plans on moving away. The trip can be used to go over any post-high school anxiety (for parents and teens), since teens can get familiar with their home away from home and parents can get a sense of what they'll (potentially) be paying for.